Subsurface Fires- burning in the duff, partially decayed leaves and woody material do not pose a great safety hazard to the fire fighters. Be careful to not step into burned out root or stump holes. Be extra cautious if the fire is burning in “winter” landings as the burned out material may create deep and very hot holes. If a ground fire extends in to large quantities of dead or dry material accumulations the fire may spread rapidly. Fire fighters must be aware of possible fire entrapment situations and take avoidance procedures. Surface This is the main area in a forest where people walk and what they see most commonly. The surface fuels such as grasses, small shrubs, bushes, windfall, slash, and lower branches of standing trees, are all in this zone. Fires in this zone are subject to winds therefore there may be more radiant heat, smoke, flames, flare-ups and sudden change of fire spread direction. Heavy fuel accumulations and higher surface winds create potential conditions for entrapment. Crews must know where their minimum of two valid escape routes are at all times. Ladder Fuel Zone The ladder fuels are considered to be the lower hanging branches from standing trees. These branches are often dead, covered in moss, and almost touch the ground. If a fire reaches ladder fuels it may “climb” the branches up and into the crown of the tree. The rapid burning up a single tree or even a few trees in a group is called candling or torching. This is an indication that at least at that location, conditions are good for more candling and potential crown fire behaviour. Crews should be re-briefed and overall fire conditions should be reassessed. Are the safety zones still safe? What are the latest known weather reports? Are all communication systems functioning properly? Crown Fire A Crown fire consists of the upper canopy or branches, (tree tops) catching on fire - and then a large group or area of trees in the forest all burn in the same manner. This is a "running crown fire" and is extremely dangerous. Fire crews should not be present as they will be in harms way. Crews must be pulled back to safe zones PRIOR to this extreme and dangerous fire behaviour. Caution should be exercised in proportion to the type, quantity, size, spacing and moisture content of the forest fuels. Wet fuel (high moisture content) will not generate the same heat intensity as will dry fuels. 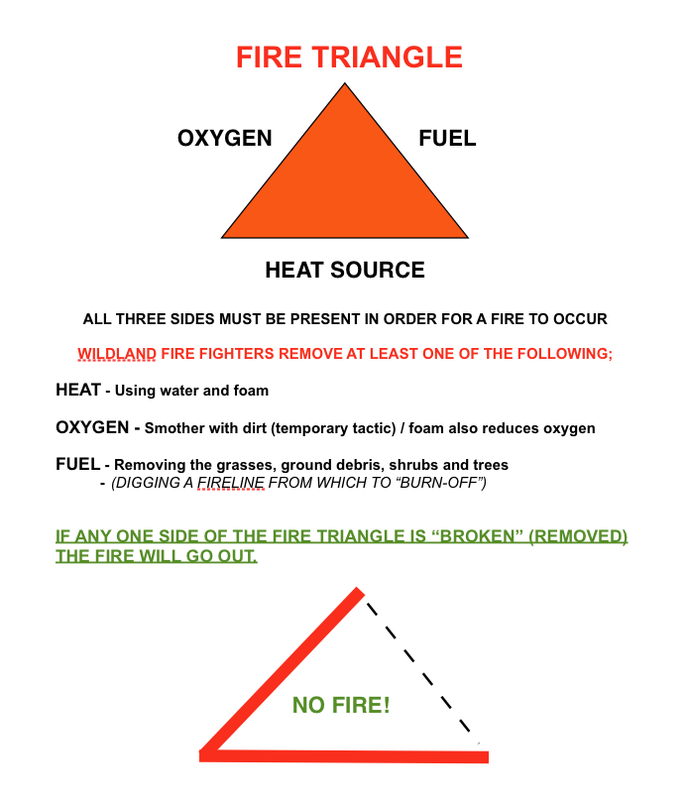 Light, (fines) dry fuel such as pine needles and grasses will ignite very easily. A fire burning in light fuels may spread very rapidly. Larger diameter branches and logs are considered heavy, slower burning fuels. Areas of dense accumulations of heavier fuels (fuel loading) will be more hazardous because of the high heat intensity that will occur. It is also more difficult to work in areas of thick, heavy brush and windfall, etc. thus tactical withdraw considerations must be given more time allowance. The crew may fatigue more rapidly in these areas due to the intense labour involved to build fire-line. A fire burning in heavy accumulations generally will travel (spread) at a slower rate than lighter, fine fuels. Broad-leaved trees (deciduous - loose leaves in fall) generally grow where there is more ground water, thus the tree is usually holding a higher water content. (moisture content) Stands of these trees, may, in some instances, be used as temporary safe zones. They may also be a natural part of the overall fire control line. There is recent and ongoing research being carried out in regards to fire behaviour in Mountain Pine Beetle infested stands of timber. It must be clearly understood that fire behaviour in Mountain Pine Beetle infested stands of timber may be very unpredictable and extreme. Aerial firebrands (airborne burning debris and sticks) from stands of dead, greyed up (no needles) trees may also be of considerable issue. Be aware of possible fire entrapment situations and exercise extreme caution. Firefighters must also be very very wary of any dead standing tree. Trees killed by the Mountain Pine Beetle may break off or fall with no advance warning and with the slightest of disturbances. (a breeze or ground vibrations) Be safe! Weather is dominant in fire fighting safety. Hot, dry and windy conditions are far more dangerous than cool, moist conditions with little or no wind. Key components of weather are; temperature, wind, precipitation and R/H (relative humidity, measured in a % - This is the amount of water in the air at a given time). Humidity affects the moisture content of the fuel. Caution must be exercised as weather conditions become more severe. (hotter, drier, and increased winds) If a strong “wind event” is predicted the local Fire Centre will issue a “weather advisory” to all crews in the field. Crews must be prepared to withdraw or evacuate from a fire if weather conditions deteriorate. Weather has a major influence on all field planning operations. During a normal summer day, fire behaviour conditions will become more severe and aggressive as the day warms up into the late afternoon. Up- slope winds usually increase during this same period. Inversion - An "inversion" is a micro-climate (weather) situation that may occur in mountainous terrain. A layer of warmer air may become "trapped" between layers of cooler air above and below. Fire behaviour in this layer (inversion zone) will be more active than above or below. Topography is the “lay” of the land or terrain. We may describe the topography as flat, rolling, steep, or mountainous with gullies and canyons. Slope can have a dramatic affect on fire behaviour. Fire will move up-slope and spread more rapidly than on flatter ground. Daily, up-slope winds help this to occur. Flames are also closer to the fuels above and preheating and drying occurs. The hotter air from from flames causes more up-slope wind currents to be formed. Another reason fire spreads faster on hillsides is that burning pine cones, branches and debris may roll back down the hill, spreading more fire. Fire fighting on steep and often rocky slopes is hard work. Rolling rocks loosened by fire crews are a hazard to crews working below. The gullies and canyons on hillsides are danger areas because “chimney effects” occur in them. Natural and fire caused up-slope winds will be funneled into these gullies. Fires will burn more intensely and rapidly up gullies. Never attempt to take shelter from a fire in a gully. If you find you are suddenly above the fire, never try to outrun the fire by going up hill. Run down and out to the sides, away from the fire. There should be lookouts on all fires and their job is to advise fire crews of serious and sudden threatening fire behaviour. Southern exposures (aspect) generally have lighter fuels (grasses) and are usually warmer. Fires will travel rapidly on south aspects - but often slowing down considerably once the fire reaches the crest or shadow line of the forest. Northern exposures generally have greener fuels and are somewhat cooler and retain the moisture longer. Fires are often not as intense on the north side. The fire rank system enables the fire fighter to better understand the fire conditions they will encounter, and to enable better communications of these same conditions to other crews. The general ranking system below will assist a fire fighter in determining what a fire may look like and some basic fire behaviour which may be expected. Smouldering fire in or on the ground. Slow moving, creeping type of fire. No flames visible and produce a white smoke. If the Drought Codes are high, mop-up may be extensive. It may be safe to attack a Rank 1 or Rank 2 fire on any side. Moderately aggressive surface fire in brush and lower limbs. Flames 1 - 2 meters. There will be an organized front. Hand constructed guards may be challenged unless immediate and proper burning-off is conducted as the guard is being built. If wind driven, this fire will produce spot fires. High vigor fire burning on surface and into some tree tops (candling). flames over 2 meters in height. Fire crews should regroup and re-assess the fire conditions and action plan. Tactical withdraw is the recommended action. Short range spotting will occur. Generally not safe to be at the head of the fire. Flanking and burn-off action will be required by professional fire crews. Extreme surface fire behaviour. Whole trees engulfed and fire beginning to jump from tree top to tree top (running crown fire). Serious fire spotting will occur. Ground action only at base and maybe flanks, well away from the Rank 5 fire behaviour. Crews must move back to safe zones as a tactical withdraw before a full scale evacuation may be required. Ministry of Forests crews should be taking over full contol of fire suppression activities. Fire action plan must be re-assessed. Aerial action may have limited or very site-specific value. Total blow up or conflagration. Rate of spread is extreme. This is a full running crown fire. Fire brands, (airborne burning debris and sticks) fireballs and general very extensive long distance spotting. Fire crews and aircraft will not attempt to attack Rank 6 fires.